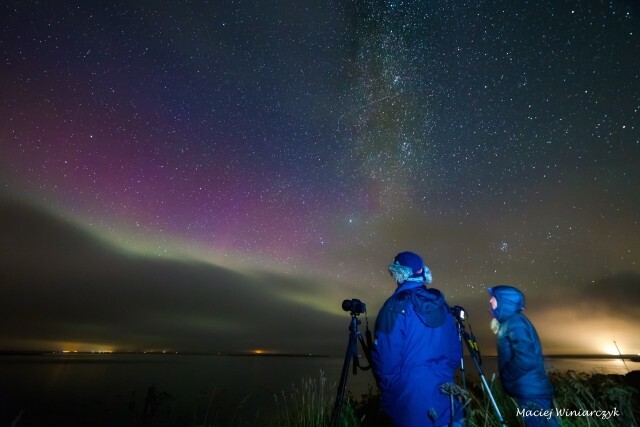 When I was on Orkney earlier this month for the Orkney Science Festival I was lucky to spend some time with members of the Caithness Astronomy Group – Gordon Mackie, Maciej Winiarczyk and Stewart Watt (who all featured in my book sharing their stories of seeing the aurora in Scotland). They are all keen auroral photographers and have had their photographs published in numerous magazines. In the evenings we went out looking for aurora. We weren’t lucky enough to get good northern lights displays this time (and the cloud kept coming in) but we did take some nice pictures of the milky way. Gordon and me trying to photograph the aurora as the clouds came in. The stars were beautiful. Photo by Maciej Winiarczyk. Think about composition – look for foreground interest. Moonlight will illuminate foreground objects and water will reflect aurora. Use a torch to “paint” interesting details in your foreground. Enjoy watching! Take the time to actually watch the display. Gordon, Maciej and Stewart like to set the camera up to record time-lapse when the aurora is active so that they can sit back and watch. 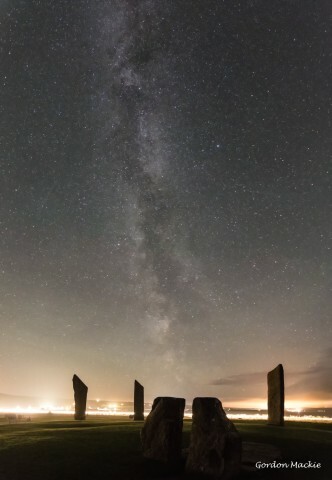 The milky way seen over standing stones at Stenness, Orkney. Photo by Gordon Mackie.